FIVE FACED (Panch MUKHI RUDRAKSHA). 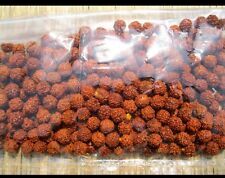 RUDRAKSHA BEADS SIZE- 7-8 MM. The planet associated with 5 mukhi(Faced) rudraksha is Jupiter. TOTAL 108 1 BEADS. Hence, 5 mukhi(Faced) is associated with learning, developing one’s own uniqueness. God Shiva Dancing God Nataraja Natraja. Hindu Bronze Lord Statue Holy Mini Style #2. Style : Asian Oriental, Hindu. Materials : Copper bronze. (WILL BE BEAUTIFULLY WRAPPED IN WHITE TISSUE PAPER.). The five faced (mukhi) Rudraksaha beads in this mala represents Lord Shiva, It is Beleived that Rudraksha seed was originated from the tears of Shiva. 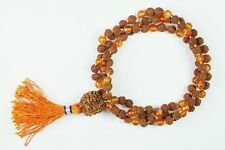 Rudraksha seed malas are the original Vedic Beads of Power worn by the Yogis of India and the Himalayas for thousands of years. People who are attached to their ego would not be able to receive the idea of Kali and she will appear in a wrathful form to them. But people, who are engaged in spirituality, removing the illusion of the ego, will find Maha Kaali in a different form. 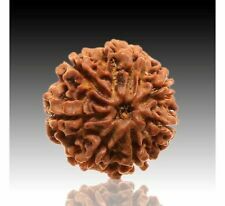 Seven mukhi Rudraksha is a symbol of Mahalakshmi, the Goddess of purity and wealth. Lakshmi is described as bestowing coins of prosperity while sitting on a pristine Lotus flower. The planet related to 7 mukhi is Venus. This is the most sacred Yantra in our shastras. It bestows popularity and favour from Govt., officers and political leaders. Sampurn Shri Yantra consists of thirteen Yantras. 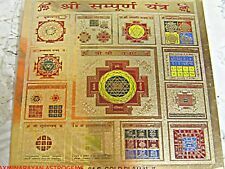 Kuber Yantra, Laxmi Ganesh Yantra, Ganpati yantra, Sampoorn Maha Lakshmi Yantra, Sukh Samridhi Yantra, Vastu Maha Yantra, Santan Gopal Yantra. He is the Lord of success and destroyer of obstacles. GANESH IDOL. IDOL HEIGHT – 6.5 CM. IDOL BREADTH - 4.5 CM. IDOL LENGTH - 1 CM. The Shri Yantra has a long tradition as a tool in vedic Vastu to correct all imbalances in a house and draw in positive vibrations and prana. When combined with 'pyramid power' you get a superior energy tool. Tulsi wood, which is in the family of basil, is the most sacred of all wood in the Hindu tradition. In India, the Tulsi is regarded as the most sacred plant. Its leaves are aromatic and they have minute glands. Contains 24 to 28 Beads in one bracelet depending on the width of the beads. Stretchable/ Adjustable Bracelet. Contains 24 Beads in one bracelet. Stretchable Bracelet. Also available in 8mm/30beads 9mm/28bea daand 10mm/26beads. 5 mukhi Rudraksha represents Lord “Rudra Kalagni” which symbolizes the 5 forms of Lord Shiva. The planet associated with 5 mukhi rudraksha is Jupiter. Hence, 5 mukhi is associated with learning, developing one’s own uniqueness. It should be kept in a Locker or in The Puja Ghar wrapped up with a Yellow or Red cloth.It is believed that the Goddess Lakshmi, resides permanently where the Shreephal is kept. The Laghu Nariyal is proven and tested to be effective as a good luck charm to get all the luxuries of life. Religious Brass Tri Shakti (Swastik Om Trishul) Yantra. This Tri-Energy symbol purifies the whole atmosphere. It is helpful to remove all faults. In India the three most auspicious signs are those of "SWASTIK, OM and TRISHUL ". 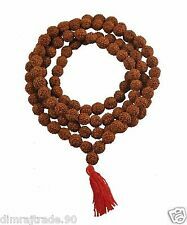 Rudraksha beads have been worn by the yogis and saints of Nepal And India since at least since the 11th century. 5 mukhi Rudraksha represents Lord “Rudra Kalagni” which symbolizes the 5 forms of Lord Shiva. Lord Yama God Of Death Buddhism Amulet Brass Sculpture Religious Statue Hindu! Lord Yama God Of Death Buddhism Amulet. 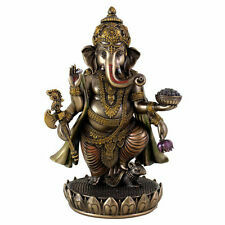 Brass Sculpture Religious Statue Hindu Mini Style! The Godof Death. When you kept it with you, other people will love and kind to you. They'll give you a great respect. The Yantra provides a focal point that is a window into the absolute. Eventually, the object is dropped when the mind can remain empty and silent without help. The Yantra is like a microcosmic picture of the macrocosm. The combined imagery, and the cardinal lesson it holds, actually teaches the beholder the art of living. Learning makes a person knowledgeable and wise. By doing so he can enrich his productivity by overcoming obstacles. GOMATI CHAKRA. What exactly is a gomti chakra and how does it benefit you?. Read on to find out how this natural stone can improve your life! It is believed by astrologers that wearing the gomti chakra as a pendant, ring or earring can cure problems that affect a person. SRIYANTRA GOLD PLATED. A shree Yantra is the sound vibration of the cosmic Om Seen as a visual diagram. Beej Mantra for this Yantra :-. Shree Yantra is a yantra (device) dedicated to Goddess Lakshmi. It blesses the owner of this Yantra with wealth & prosperity. It bestows wealth, prosperity and good fortune on the owner of this Yantra. SHRI KUBER YANTRA. The Yantra provides a focal point that is a window into the absolute. SHRI DHANDA LAXMI PRAPTI YANTRA. Shri Laxmi Yantra transforms all your losses into profit. You will never face any financial crisis in future. Bringing back the essence of your life, Shri Laxmi Yantra allow you to prosper. Lord Lakshmi Statue God Hindu amulet. The Lord Lakshmi. The God Hindu will bring you Luck, Good things will unexpectedly happen to you. It also make you success in anything you hope for. This Amulet will bring Prosperity and ensure success in human endeavors. This Yantra also eliminates the harmful effects of malefic planets, especially Saturn, which are usually responsible for misfortunes, sufferings and sorrows in life. Mahakali Yantra is very powerful and tested Yantra.One should keep the image of Kali while performing puja on it. Six mukhi Rudraksha is ruled by Kartikeya, the six headed son of Lord Shiva who represents the senses. The wearer of 6 mukhi rudraksha is blessed with the qualities of Lord Kartikeya. The planet associated with this bead is Mars. Lord Ganesha P oster. Mint Condition. Benefits of Parad Shivling is given below Material: Parad. Ling Rahasya, the letters in Parad stand for Shivling is made for the benefit of people of the world for peace and prosperity. 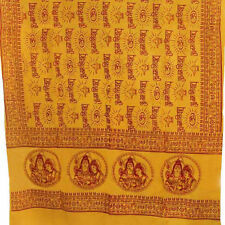 If kept during a religious gathering, it brings knowledge by evoking Goddess Saraswati. The stem of the tulsi plant is used for preparing these malas. Thus, its regular use improves the state of your health. Black beads for chanting mantras. Each bead knotted Individually in Blue thread. Laghu Nariyal bestows a person with wealth and comforts of life as per our ancient scripts. It should be kept in a Locker or in The Puja Ghar wrapped up with a white cloth.It is believed that the Goddess Lakshmi, resides permanently where the Laghu Nariyal is kept. Fighting with the demon Raktabija was an impossible feat because every drop of his blood that fell to the ground gave rise to another demon. 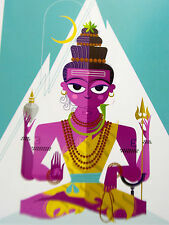 The Gods went to Shiva - the god of destruction in the Hindu trinity - for help. Shri Nav Grah Pujan Nine Hindu Planets Yantra. The Largest collection of Hinduism. 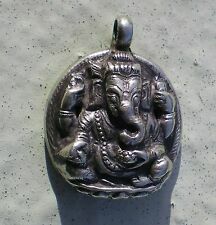 This is a beautiful Locket/Pendant with a picture of God Divya Shiv in the Centre and Shiv Yantra on the other side. Religious Divya Shiv Yantra Locket – Pendant . 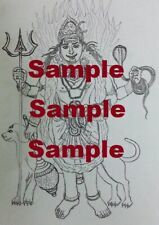 Lord Mahadeva (Shiva): Shiva is a Hindu God. Very Rare "root" that is actually a seed pod from INDIA. Traditionally and in folklore used for blocking evil and stopping jinxes. Mojo bag item for luck or a Fertility item. Interesting item conversation piece. It is most powerful device to balance Yin and Yang energies around us(as attempted in Fengshui protections). This is not just a myth – it's a tried and tested process. Shree is the personification of Goddess Lakshmi herself. Sriyantra is One of the most auspicious, important and powerful Yantra. Its archetypal form is a ladder of spiritual ascent for the seeker. Viewed from the center outwards, the Shree Yantra is a diagram of the Hindu vision of the evolution of the cosmos.